This week we see two releases hitting the PSN in their localised forms. First is Ar nosurge Plus, the enhanced PS Vita version of the PS3 game Ar nosurge that was released (and I reviewed) last year that boasts extra content and DLC for those who didn't play the game and for those who loved it. 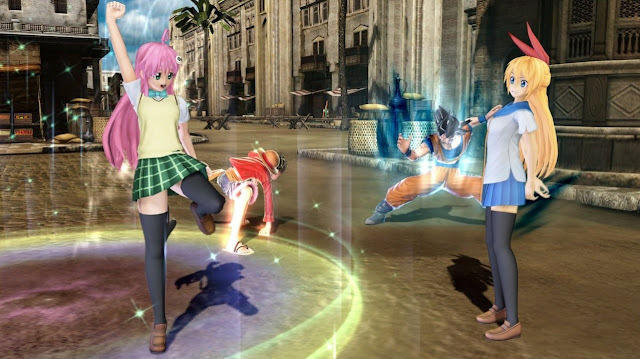 Second is the cool Japanese fighting game J-Stars Victory VS+ which features a ridiculous cast of characters from anime ranging from Dragon Ball to Assassination Classroom to To Love-Ru to Jojo's Bizarre Adventure. Anime fans will probably want to pick this up this fun game! For those who aren't interested in the new releases or who enjoy saving money, the Big In Japan sale is still going, so if you need a new JRPG, you can probably find one at a great price. Enjoy your week and happy gaming! Pick of the week: J-Stars Victory VS+ for it's ridiculously diverse cast. Seriously. How are characters from Dragonball Z and Nisekoi in the same game? Brilliant. I love hearing your thoughts, so please comment below or send a tweet to @JRPGJungle and follow to keep up with the content I post. :) Thanks for stopping by!